It has become clear that no consensus has developed to support the Administration's proposal. I do not believe that the plan on the table will pass as it currently stands, and we are running out of time. Tomorrow morning, I will suspend my campaign and return to Washington after speaking at the Clinton Global Initiative. I have spoken to Senator Obama and informed him of my decision and have asked him to join me. McCain wants Bush to hold a meeting with leadership in both houses (plus Obama and McCain, for reasons left unexplained — perhaps because "so you can't keep studying up for the debate, nerd" didn't ring very presidential) to solve the crisis by Monday. "It's an extraordinary move, plainly aimed at appearing presidential and above the partisan fray at a time of great challenge," writes Jonathan Martin at Politico. "It comes a week after McCain struggled to find his footing on the crisis and as national and state polls show him slipping in large part because of voter concerns over the economy." 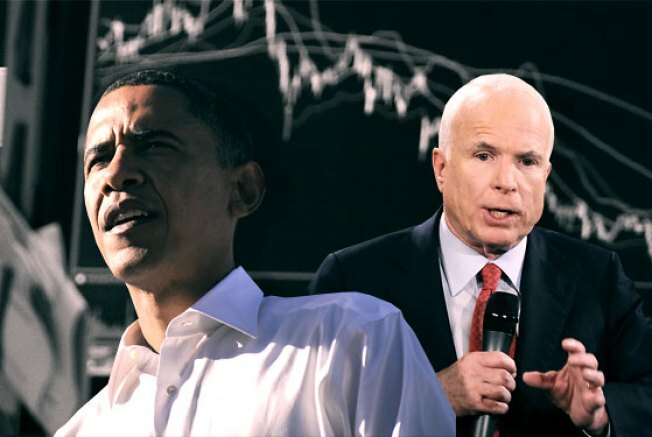 McCain is aggressively attempting to change this week's story line in the race — that he doesn't know or care enough about how to solve the crisis — into one where Obama is put into a position, once again, of having to prove how he values the country over his own ambitions. McCain is positioning this announcement as "post-partisan," equating the situation again with September 11, when party leaders came together. This echoes his unpopular, but similarly gimmicky, push for a "panel" to examine what led to the current crisis. Setting aside the fact that this announcement will surely serve only to muddy the waters and scatter any progress made thus far in Congress, the ball is now in Obama's court. Will he agree to delay the debate? Or will he agree to McCain's meeting, but point out that a few hours of televised discussion on Friday night isn't going to stop anyone from solving the economic crisis? Update: Obama says the debate is "still on," and staffers reveal that it was actually he who first reached out to McCain today, proposing the idea of a "joint statement of principles."